Dental crowns or caps help to preserve the function of badly damaged teeth. 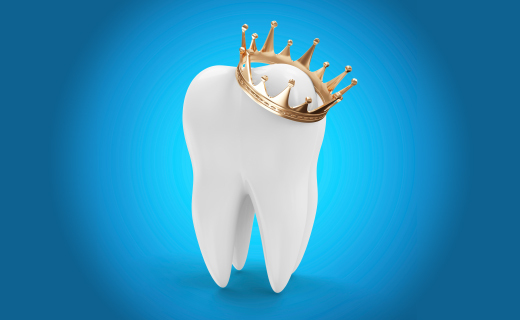 Crowns can be placed to protect fractured teeth or teeth with severe decay. New crowns can replace pre-existing ones. A dental crown fully encases a weak or vulnerable tooth to reinforce its stability and give it a natural appearance. Today’s affordable dentist has a variety of treatment options for restoring teeth. Whenever possible, all conservative options should be considered before covering a tooth with a full crown. Getting a Crown: Planning and Procedure During your consultation, your dentist will take impressions of your tooth so a dental lab can create a custom crown. He or she will explain every step of the crown process, and discuss details such as anesthesia and sedation options. During the crown placement procedure, your dentist will prepare the tooth before placing a temporary crown. If the dental clinic uses CAD/CAM chairside technology, no temporary crown or separate visit for crown placement is necessary because the permanent crown is created on site. It’s important to follow your dentist’s recommendations for aftercare and maintenance. Common Types of Dental Crowns The most common types of full-coverage dental crowns available to cosmetic dentists are porcelain fused to metal, all ceramic, and gold. Porcelain-fused-to-metal crowns provide a durable and attractive tooth surface. One drawback is the tendency for the metal core material to show as a dark line at the base of gums as they recede over time. Crowns with an all-porcelain collar eliminate this problem. All-ceramic crowns offer a metal-free option with light transmission for lifelike characteristics. Because there is no metal core, the crown can be made thinner, which makes it ideal for areas with space limitations. Gold dental crowns, while not favorable aesthetic choices, provide a stronger and more durable solution for molars and for patients who have strong bites or grind their teeth. Gold crowns also last longer and are less damaging to opposing teeth. Seek an affordable dentist who will help you determine which type of crown is best for your needs and budget. To learn about our family dentistry practice in Atlanta, call today at or make an appointment. Dental One Associates offers affordable family dentistry and gentle, compassionate dental care in Atlanta. With 8 affiliated practices throughout Georgia, our offices are conveniently located with extended hours to meet your needs. At , we provide most dental services, from basic preventative care and general dentistry to specialized procedures and complete dental reconstruction. We accept most dental insurance plans and offer affordable financial solutions for any budget. Patient satisfaction is our top priority and we strive to provide the exceptional, affordable dental care and personal touch that lead to lasting relationships. A smiling patient is our greatest reward and we look forward to keeping those smiles healthy, beautiful, and bright. Discover an affordable dentist who truly cares at .